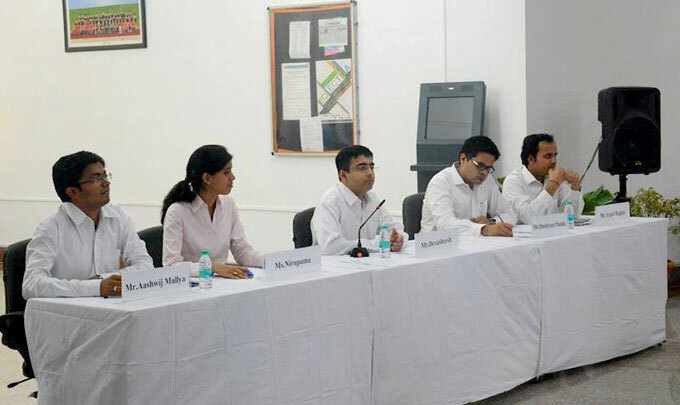 As the nation waits with bated breath to hear what the new government has to present in its first ever budget, IIM Raipur held a pre-budget discussion to find out what the young minds of the institute expect India’s Finance Minister to deliver on July 10th. The session was opened by Prof. B. S. Sahay, Director IIM Raipur, who stated why it is crucial for such discussions to be held. He urged the students to participate and share their views. He mentioned that such discussions should happen every year so that it will help to put what is learnt to practice in real life. The first panel discussion revolved around ‘Agriculture and Rural Development’ where IIM Raipur students spoke about how India’s agricultural sector needed a stimulus. A huge part of this would come in the form of creating provisions for smart villages which will be self-sustaining in nature. The expectations from Budget 2014-15 for the agricultural and rural sector are that there should be a boost in infrastructure spending which will give an impetus to the agricultural sector. New schemes on micro financing and provision for alternate form of energy will help revive the sector. The students ended the discussion with how the expectations from the budget are high and how it would certainly bring in policies that would improve the sector that is the largest source of employment in the country. The second panel discussed and deliberated over ‘Infrastructure and Industry’. The students spoke on how till date the manufacturing and infrastructure sectors have been performing. A huge section of the Indian population still lacks access to proper roads. The capital investment in the sector has not yet brought in the transformations expected. This sector provides employment opportunities for the youth. Yet, there has been a slack which has resulted in a slowdown in this sector. The panel members agreed on how the new government must certainly bring in policies which will help the sector grow. India’s development story depends heavily on how the country’s infrastructure and industry sector perform. The third panel discussion was on ‘The Financial Sector’ in which the students talkedabout the banking sector, insurance sector and capital market. The panel discussed how the sector was facing the downside of a slowing economy. The banking sector has been experiencing an increase in the percentage of non-performing assets. With the issuance of more banking licences the sector is poised to have a positive outlook provided it gets the necessary support from the new government through favourable policies in the upcoming budget. Through policies that promote financial inclusion of the rural sector, the Budget 2014-15 will certainly help the rural areas develop. This was followed by the fourth panel discussion on ‘Taxation’. The panellists noted how tax contributes to 10.66% of the country’s GDP. However, only 10% of Indians pay their taxes. The panel’s discussion revolved around direct tax, indirect tax, goods and trade tax and retrospective tax regimes. The Government of India should set clear policy and stand by them. Retrospective amendments are detrimental towards the investment climate of the country. Taxation should be made investor friendly and transparent tax structure should be encouraged. GST remains the most important component of tax reforms. It is a revenue sharing order between the centre and the states. Gradual implementation is the route to a successful rollout of the progressive taxation scheme. Not just “tax terrorism” but also “red-tape terrorism” arising out of the laid out procedure should be curbed. The event’s final panel discussion was on ‘Social Sector Programmes.’ The students broadly discussed topics like job creation, poverty alleviation, social healthcare, education, food, water, sanitation and so on. The students proposed budget allocation on nation-wise incubation centre and to encourage SMEs and social entrepreneurship. Provisions fortax benefits for specially abled and senior citizens would be helpful to the country. Larger allotment for schools and research in biotechnology would help the education and healthcare sectors. They suggested that the PDS could be made efficient following the Chhattisgarh PDS model. This ended the discussion of the pre-budget session organised by IIM Raipur. 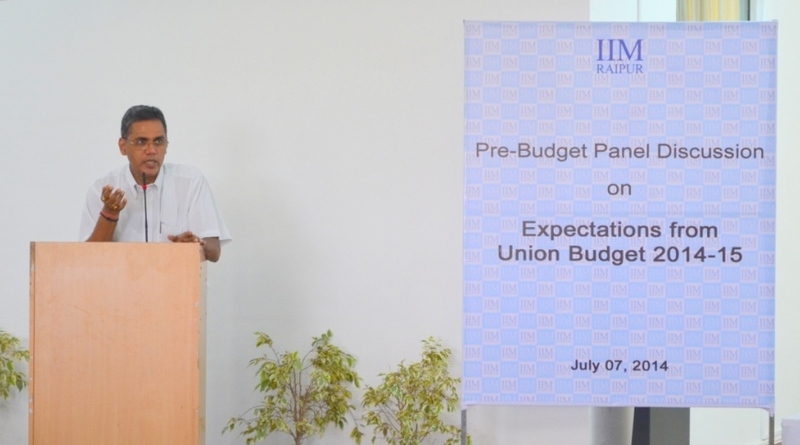 The pre-budget discussion was a beginning to a new culture at IIM Raipur. This was encouraged by the professors so that it creates knowledge sharing opportunities. It created awareness and gave the students an opportunity to opine on matters that will affect them directly or indirectly. Such discussions will keep the tradition of learning and sharing ideas alive in the young and bright minds of the future of this country.